"It is their world now. The dead are hungry and do not discriminate." By morning, the sun weeps over streets splattered blood-red as an unsettling silence soon follows, lulling the broken remains of society into believing the blood bath is over. Survivors gather to lick their wounds and mend their broken hearts and ravaged lives as local governments struggle to maintain law and order. As a second wave approaches, a handful of survivors from all walks of life must put aside their differences and band together to escape the pending slaughter while storm clouds begin to gather from within their fragile community. Some who were once respectable in the eyes of society will devolve into madness while the despicable rise to the occasion in a world no longer respecting of persons. It is their world now. The dead are hungry and do not discriminate. Don't Feed The Dark has not been tagged yet. Help others find Don't Feed The Dark by tagging it! 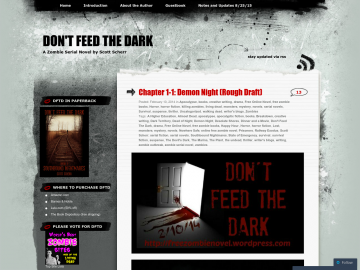 Don't Feed The Dark has not been reviewed yet. Don't Feed The Dark has not been recommended yet.